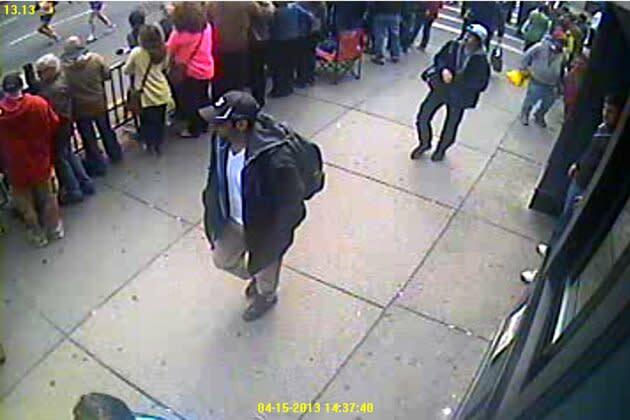 BOSTON — The FBI intensified its manhunt in the Boston Marathon bombing case on Thursday by releasing images of two men they deem to be suspects. Investigators asked that anyone with information about the men or who may have seen them in the vicinity of the race finish line on Monday to step forward with information as soon as possible. At a late-afternoon news conference here, FBI Special Agent Richard Deslauriers released surveillance tape and displayed photos of two young men captured in the moments before the twin explosions that killed 3 and injured 170. "Somebody out there knows these individuals as friends, neighbors, co-workers or family members," Deslauriers said. “Though it may be difficult, the nation is counting on those with information to come forward and provide it to us." Early Friday morning, investigators added enhanced photos of both suspects to the FBI website. The release of the images represented a significant breakthrough in a massive manhunt that has consumed local, state and federal law enforcement since the detonation of two shrapnel-packed bombs that plunged the annual Patriot's Day race—the nation's most prestigious marathon—into terror and chaos. The man Deslauriers called Suspect One is seen wearing a dark hat, while Suspect Two is wearing a white hat. Deslaurier said Suspect Two is believed to have set a backpack down in front of the Forum restaurant along the marathon route near Copley Square. 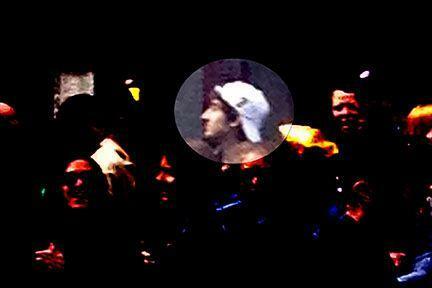 Deslauriers said the two men appeared to be walking together along Boylston Street in the vicinity of the explosions. "We know the public will play a critical role in identifying and locating these individuals. Somebody out there knows these individuals," Deslauriers said. Supect 1 (left) Suspect 2 (right) (FBI.gov) Click image to see more photos. He described the men as likely armed and extremely dangerous, and said no one should try to take any action to apprehend them. He said those with information should contact law enforcement. On Thursday morning, Homeland Security Secretary Janet Napolitano asked for the public's help in identifying possible suspects. "I wouldn't characterize them as suspects under the technical term, but we need the public's help in locating these individuals," Napolitano said when asked to give an update on the marathon probe during a Committee on Homeland Security budget meeting on Capitol Hill. "The investigation is proceeding apace," Napolitano added. "This is not an 'NCIS' episode. Sometimes you have to take the time to properly put the chain together to identify the perpetrators." Suspect 2 (FBI.gov) Click image to see more photos. Also on Thursday morning, the U.S. attorney's office for the District of Massachusetts sent out a tweet encouraging anyone with information to submit clues, video or photos to an FBI Web page dedicated to the investigation. President Barack Obama and first lady Michelle Obama flew to Boston on Thursday to attend an interfaith memorial service and visit hospitalized victims. "Every one of us has been touched by this attack on your beloved city. Every one us stands with you," Obama told the crowd attending the church service at the Cathedral of the Holy Cross in Boston. There, Obama honored the families of those killed in the blast—Martin Richard, 8, of Dorchester; Krystle Campbell, 29, of Medford; and Lingzi Lu, 23, a Boston University graduate student from China. The improvised explosive devices were located about 100 yards apart in the bustling Copley Square area. Several blocks of Boston's downtown remain closed as authorities comb the area for evidence. To contact the FBI with information, call 1-800-CALL-FBI or online at bostonmarathontips.fbi.gov. Yahoo News' Beth Fouhy contributed reporting from New York.